Time required: From one day to a couple of days. Place required: Urban area with gardenable places. 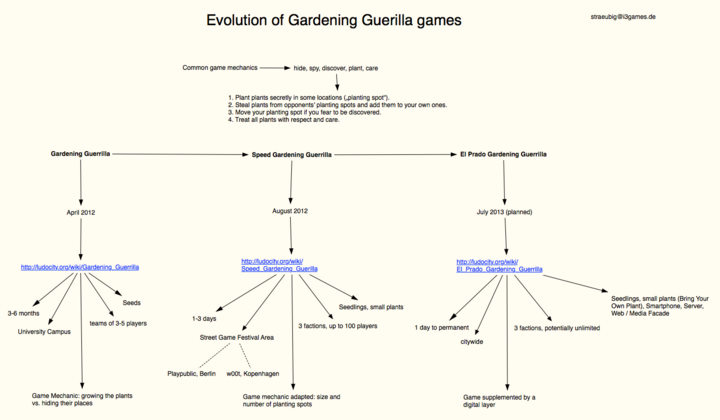 Speed Gardening Guerrilla (SGG) is a Guerrilla Gardening game. It is a short-term variant of the original Gardening Guerrilla. SGG is played in a number of rounds. Players score by planting and by stealing plants from their opponents. Players may drop in and out of the game at any time, thus the game can run for several days during an event. The moderator specifies the number of rounds and the play area. The round time defaults to 24 hours. The play area should be large enough, so that players can act autonomously without necessarily running into the other players. However, encounters should be possible and players must be are able to discover and spy on each other. The moderator also prepares a number of small plants / seedlings that are appropriate for the season and suitable for the planting sites that players might find in that area. Seeds are not recommended due to germination time. You need material in three colors to label the plants and the players, like garden markers for the plants and badges for the players. Or simply use adhesive tape. The players should have access to a map of the game area and to the rules of the game. Each faction is handed one initial plant. Players and plants are labelled according to their faction. They are given appropriate time (one hour suggested) to plant the first seedling within the game area. A faction plants their seedlings in one or more places ("planting spots") in the play area. A planting spot should enable your plants to grow without mutual disturbance but be identifiable as one continuous location (i.e. not exceed, say, 1 - 2 meters in diameter for a couple of plants). After planting, report the location to the moderator, who keeps a record of the number of players for each faction and a private map of the spots. When a faction has planted the seedlings they currently possess they may ask the moderator for the next batch of seedlings (see #Plant distribution). Plants received from the moderator can either be added to an existing planting spot or used to open a new one. A faction may relocate one of their planting spots at any time. All plants at a particular location (the planting spot) must be moved together, and planted in a single new location. After moving a spot, report the new place to the moderator. A faction may steal one plant from a rival planting spot and add it to one of their own spots by planting it next to one of their own plants and removing the enemy marker. This plant becomes one of their own. Note that you must add a stolen plant to a spot of yours that already exists. The relocation of this plant must be finished before you can steal the next plant. Each time a faction has planted all the seedlings they have received, they may ask the moderator for a new set. The moderator supplies the remaining plants according to a Fibonacci-Series (1, 1, 2, 3, 5, 8, ...). This goes on until all plants are distributed. Each plant carries a label with the name/color of the faction that receives the plant. Note: this scheme is to encourage speedy planting. You may chose different rules for distribution, e.g. giving out one plant at a time. Players can join the game anytime. They are assigned to a faction when entering the game. Factions should keep an approximately equal number of members during the game. If somebody decides to stop playing, they may not re-enter the game afterwards. After each round there is a Guerrilla meeting. While it is recommended that all players come together, each faction must send at least one representative to the meeting. Activities that take place in the meeting are: Scoring, discussion of the game and welcoming of new players. The numbers are published immediately on the scoreboard. Note: Due to the fluid nature of the game, some of these numbers might be estimates. The moderator may also announce special events and rules changes, distribute more plants etc. during the meeting. The winner of the game is determined during the final meeting. The faction with highest score of S * P wins, i.e. the number of planting spots multiplied by the number of plants in their largest spot. The players also might want to tour the planting sites together and the moderator may award other prizes, such as: aesthetic criteria, ingenious planting spots, the most ecological faction, or the most creative guerrilla strategy. The players within a faction should come to an agreement on the best strategy for choosing the number and locations of their planting locations, bearing in mind the scoring, the chance of being detected, etc. A planting spot always consists of one or more plants marked in one color (indicating the owning faction) and zero ore more unmarked plants (stolen from other factions with their markers removed). There cannot be two different colors at one spot. Markers keep their color during the game. Players cannot switch factions. Avoid having only one planting spot, as you are stuck with it. Try to bribe other players to find out their planting locations. Use arduino-based plant detection super devices. Move more than one enemy plant at any given time. Open a new planting spot with an enemy plant. Enemy plants must be added to existing spots. Exception: if you dont have any spots, you can use an enemy plant to open your only one spot. Destroy any plants including other teams' plants. Submit false information to the moderator or mislead the moderator in any way. Move plants outside of the playing area. Travel through the playing area with a flamethrower. Kidnap the moderator to learn the whereabouts of other faction. Each game move must be carried out in one action. For example, it is not permitted to excavate and temporarily store an opposing team's plant before replanting it. Another example: factions can only steal one plant at a time. After adding the plant however, they can visit the enemy plantation again to get the next plant. Treat all plants, including enemy plants with respect. Avoid any negative impact on plants, soil and other facilities and inhabitants in the game area. If players are in doubt about the application of these rules, they should talk to the moderator. The moderator may move plants or exclude players, as a result of rules being broken. The decision of the moderator is final. 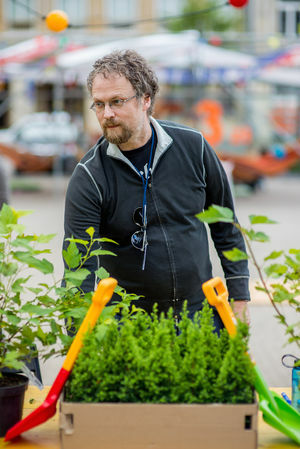 "Speed Gardening Guerrilla" is also known as "Speed Gardening Guerilla", "Street Gardening Guerilla", "Speed Guerilla Gardening" or "Speed Gardening". This page was last modified on 26 July 2014, at 11:22. This page has been accessed 166,898 times.